I started looking into research on wetland loss around the world and quickly discovered that a large portion of what’s been published is about the Gulf Coast, specifically Louisiana. I could write for days about the situation all around me, but I know that wetlands in many locations are in trouble, so I kept digging for studies outside of the Gulf of Mexico. The bad news is that I found many other areas with wetland loss, so the good news (if you can call it that) is that I can give you a global overview of the issues facing wetlands. 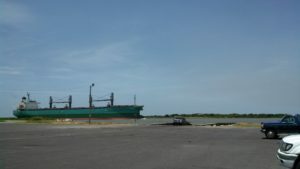 The Calcasieu Ship Channel is important for trade but also allows salt water to more easily get to freshwater marshes, especially during storms, which can be a problem for the flora and fauna. One thing to remember as we go through this is that wetlands are really dynamic systems– since water is constantly cycling through, conditions rarely stay exactly the same for long. Water flowing in can bring sediment or dissolved minerals or pollution; water flowing out can do the same thing. Water can move sediment and vegetation within the system. Add to that storm events, human disturbance, invasive species, etc. and you have a recipe for a habitat which is constantly changing. Some spots fill in, others open up; some get taller, some sink down; plant and animal communities change. If there is one thing I have truly internalized during my car and boat rides to my study sites in coastal Louisiana, it’s to expect that the route will change at some point. This constant change becomes an issue for wetland conservation because it doesn’t fit into our plans: we like to base our plans on the idea that what we see today is what we will see tomorrow, and that’s not always the case with wetlands, especially in the long-term (Larson et al. 1980). Of course, wetland conservation wouldn’t be a big concern if we weren’t losing wetland habitat on a grand scale around the world. What are the main issues facing wetlands? The larger trends are conversion to other land types, fragmentation, changes in sediment supply, and pollution. These problems have different triggers in different locations, but the result is the same- we have lost millions of acres around the globe (Wilen and Bates 1995). Many wetlands have been converted to other uses because we tend to look at water-logged land as a wasted opportunity (Raj and Azeez 2009). So we drained around 2.8 million hectares of Illinois wetlands in about 100 years to use the land for agriculture (Dahl 1990). And we built our homes and businesses on roughly 70% of the salt marshes in the greater Boston area (Bromberg and Bertness 2005). And we continue to drain land for agriculture in the Ganges/Brahmaputra delta, contributing to the ~358 km² of wetlands lost per year in the delta (Coleman et al. 2008). We also have a tendency to cut wetlands up into smaller pieces. Sometimes this is so that we have navigation channels as with the Calcasieu Ship Channel in Louisiana- ships can pass through, but so can salt water (Day et al. 2000). Or we create ditches to drain water out of marshes as part of our mosquito-control efforts (Kennish 2001), which can cause water to drain more quickly from the wetland and change the duration of flood events. We change the level of water flowing through wetlands by building dikes and levees- some of that is for flood prevention and some is to funnel water into irrigation and urban systems. In the case of the Indus River, so much water is being pulled from the river for irrigation upstream that river delta doesn’t have enough to push back effectively against ocean waves which are now eroding the delta (Coleman et al. 2008). Wetlands that haven’t been converted also find themselves deprived of the elements they need to continue as wetlands. When we create structures to stop rivers from flooding, we prevent river sediment from reaching wetlands on either side (Day et al. 2000). This creates a problem because river sediment takes a while to fully settle and compact- without the addition of more sediment, areas that are above water now will subside in the future. And some of the water that does reach the wetlands is not exactly clean. Wastewater running into China’s wetlands increased dramatically in scale between 1980 and 2000, but facilities to treat the wastewater were not always effective at removing contaminants (An et al. 2007). So there are big problems facing wetlands around the world- luckily, there are also a number of initiatives, large and small, trying to slow and even reverse these declines. The Ramsar Convention signed in 1971works at an international level to conserve important wetland habitats around the world. In the US, the National Wetlands Inventory started work in the 1970s and regular reports with maps are created every 10 years to monitor progress and problems (Wilen and Bates 1995). But what can we do to restore these vital habitats? Now that I have a sense of the problems facing wetlands, for my next post I’ll look into means of addressing these problems, looking at strategies for restoration and mitigation. An, S., Harbin Li, Baohua Guan, Changfang Zhou, Zhongsheng Wang, Zifa Deng, Yingbiao Zhi, Y. Liu, Chi Xu, Shubo Fang, Jinhui Jiang, and Hongli Li. 2007. China’s Natural Wetlands: Past Problems, Current Status, and Future Challenges. Ambio 36:335–342. Bromberg, K.D., and M.D. Bertness. 2005. Reconstructing New England Salt Marsh Losses Using Historical Maps. Estuaries 28:823–832. Coleman, J.M., O.K. Huh, and D. Braud. 2008. Wetland Loss in World Deltas. Journal of Coastal Research 24:1–14. Dahl, T.E. 1990. Wetlands losses in the United states 1780’s to 1980’s. US Department of the Interior, Fish and Wildlife Service, Washington, D.C.
Day, J.W., L.D. Britsch, S.R. Hawes, G.P. Shaffer, D.J. Reed, and D. Cahoon. 2000. Pattern and Process of Land Loss in the Mississippi Delta: A Spatial and Temporal Analysis of Wetland Habitat Change. Estuaries 23:425–438. Kennish, M.J. 2001. Coastal Salt Marsh Systems in the U.S.: A Review of Anthropogenic Impacts. Journal of Coastal Research 17:731–748. Larson, J.S., A.J. Mueller, and W.P. MacConnell. 1980. A Model of Natural and Man-Induced Changes in Open Freshwater Wetlands on the Massachusetts Coastal Plain. Journal of Applied Ecology 17:667–673. Raj, P.P.N., and P.A. Azeez. 2009. Real Estate and Agricultural Wetlands in Kerala. Economic and Political Weekly 44:63–66. Wilen, B.O., and M.K. Bates. 1995. The US Fish and Wildlife Service’s National Wetlands Inventory Project. Vegetatio 118:153–169.